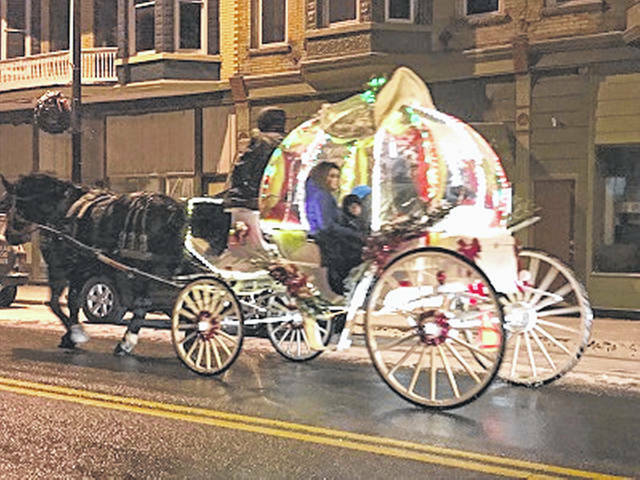 Shown in downtown Lynchburg a year ago is the “Cinderella” carriage that will offer rides again this weekend. More than a dozen homes will open to the public and there will be a flurry of holiday activity when the 26th annual Village Christmas is held in Lynchburg from 10 a.m. to 6 p.m. Friday, Dec. 7 and Saturday, Dec. 8. Tootie Pendleton, the organizer of the event, said that for several years it was organized by a business association, but now it is back in the hands of the village. Pendleton said 13 to 15 homes will be open to sell baked goods, crafts and just about anything Christmas oriented. In addition, the firehouse at the edge of town on SR 135 will have 10 to 12 vendors selling items. Maps marking the open locations will be available at the firehouse or any of the other homes, and all the homes will be marked with numbers coinciding with the map. Once Upon a Ride will offer “Cinderella” carriage rides at a cost of $3 for adults and $2 for children. A special ride that will be longer and can accomodate four adults or six smaller adults will be offered for $20. The rides will be staged from Jo’s Vintage Barber. Hot cider, coffee and cookies will be available free of charge. On Saturday, Santa and Mrs. Claus will be at the Lukas Pharmacy from 10 a.m. to noon and at the firehouse from 1:30 to 6 p.m. “So, kids can come and tell Santa what they want for Christmas,” Pendleton said. At 6 p.m. Friday a Christmas tree will be lit in the center of town near a veteran’s memorial. Southern Hills Community Bank will hold a raffle for a large flatscreen TV. The raffle also includes a gift basket from Just For Looks and free shaves or haircuts from Jo’s Vintage Barber. There is no cost for the raffle tickets that will be available at each of the open homes. On Friday and Saturday, Lynchburg Cub Scouts will sell food at the firehouse. There will be a bake sale with crafts and miscellaneous items from 10 a.m. to 6 p.m. both days at St. Paul Lutheran Church at the corner of Pearl Street and Eastern Avenue, where there will also be a toy train display. The Lynchburg Lions Club’s Christmas candy will be available at the church, Southern Hills Bank and Lukas Pharmacy. For more information contact Pendleton at 937-364-9921 or 937-509-4492.